On the hunt for a weekend game hookup? Falling Bridge may be exactly what you were looking for. Racing on a bike over a bridge that’s collapsing, you are tasked with crossing without getting beat by any of the obstacles first. Of course, you can upgrade your bike and do other things of that nature as well, and challenge your friends through Google Play Games by unlocking achievements and viewing leaderboards. You must collect coins and boosters on the way to the end of the bridge to assist you with upgrades, or else be expecting to pay up for dreaded in-app purchases. The main highlight going for Falling Bridge is its gameplay, however, and it is quite stellar. The bridge falling behind you adds to the fast-paced nature of the game, and you could easily find yourself playing for way too long. The controls are fairly simple for this sort of game — tap the right side of your screen to race, and the left side to control. Easy enough. 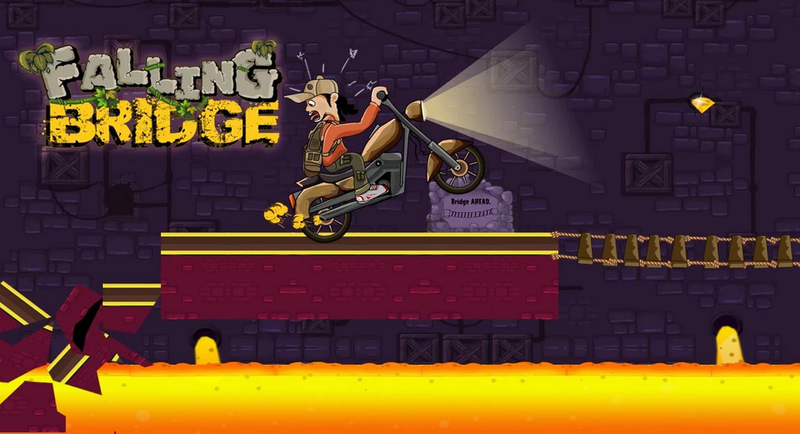 Falling Bridge is available on Google Play for free, but beware the previously mentioned IAPs. You’ve been warned.